Like many Les Paul vintage and vintage-style “Burst” owners, I’ve acquired a fascination not only with the guitar itself, but with the history of the Les Paul; from the various guitars’ provenance to the stories of how people have gained ownership of them. Could be new, could be old, doesn’t much matter to me. There’s a magic about a Burst that seems to force owners to search beyond the wonderful tone they produce. So when “Sunburst…” by Tony Bacon was released, I knew that I had to get a copy to review it. I was intrigued by the sub-title because it seemed to be the first book that I can recall that dared broach this subject. Oh, people have documented some interesting historical tidbits about various Les Pauls, and I’ve read and heard many accounts. Admittedly, I was expecting sort of a scholarly treatise on the subject of how the Les Paul gained legendary status. In that fashion, the author/researcher will “put a stake in the ground” then build his or her argument around it to prove their point. In this case though, Tony Bacon doesn’t do that. Instead he uses a chronology of events – specifically the acquisition of Les Pauls by famous and influential guitarists from the early 60’s to the present day – to infer that the guitar gained legendary status because of these events. In other words, instead of directly answering the “why” he describes the “how,” all the while assuming the Les Paul is a legendary instrument. That’s actually a clever approach as it allows him to avoid the inevitable debates and challenges that invariably accompany a “why” argument. Here, Tony Bacon assumes the reader already knows the Les Paul is legendary and he uses historical and allegorical commentary to enforce the guitar’s legendary status. Frankly, it’s great storytelling, going back to the 60’s, starting with Clapton’s first Les Paul, and closing out with today’s Les Paul giants such as Joe Bonamassa. But intermixed with the storytelling is also a bit of analysis from a collector’s point of view. Again, Mr. Bacon doesn’t necessarily take a stand, but it’s clear he sharing tidbits he has gleaned from conversations with collectors. 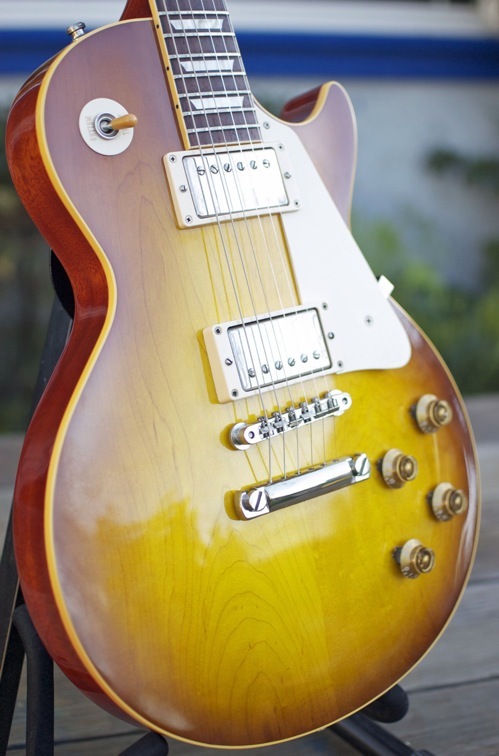 Let’s face it, Bursts are highly coveted guitars, so having a discussion not just from the point of view of great players but also collectors is valuable as it lends further insight into the Les Paul’s legendary status. So… do I recommend the book? Absolutely! It’s a quick read, but I daresay I spent a lot of time salivating over the pictures. I thoroughly enjoyed reading this book! The writing style is familiar but also knowledgeable, and I’ve actually been carrying in my backpack since I got it to pull it out when I’ve got free time. 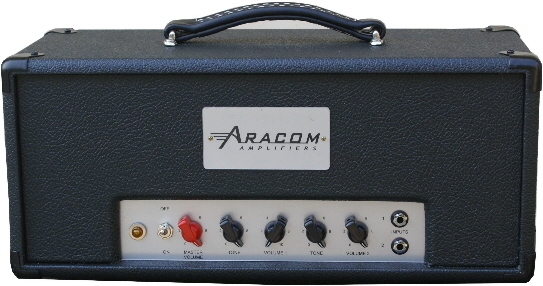 At this past Sunday night’s Mass, I got the rare opportunity to crank my Aracom VRX18 AND play it loud. This only happens if the church is packed (which it was), and we break out the full trap set (which only happens when both our drummer and bassist are present). So, knowing that both were going to be there, I planned out a much more lively set than usual. Based upon the plan, I decided to go with a classic Plexi/Les Paul combination; specifically my Aracom VRX18 Plexi clone and “Amber,” my R8 Les Paul. Invariably, I use this particular combination because it has “bite.” At least, that’s what I call it. “Bite” to me is a bright tonal character when overdriving an amp; the highs are certainly present, but not so over the top that they’re like icepicks. They’re at that level where they provide the clarity and note separation yet are still balanced with the overall sound. But on top of that, “bite” ensures you break through the mix. There’s nothing like muddy tone to get you lost in a mix. With bite, you’ll never get lost in the mix. I can achieve that bite with just about any guitar I have, but there’s a certain magic that happens when I crank the VRX18 and play a Les Paul through it. And while that amp/guitar combination sounds fantastic, when you throw the incredible Jensen Jet Falcon speaker into the fray and combine its breakup characteristics into the output, the result is absolutely magical. So in this case, biting is good!